Anything which says-‘weight watchers special’,or ‘good to snack on while on a diet’ or better still ‘tasty and low-fat’ catches my immediate attention.Sadly,most of the recipes I come across use items which are not easily available in India.So the next option is to carefully choose such recipes which you can easily recreate with items which are readily available. I had some really soft,the melt in the mouth types of Dates so I was frantically searching for recipes using the same.Of course the first choice was Dates cake,but I am on a no-baking mode these days,God knows why.Some time back,I bought a Dry fruits Laddu from Adyar Ananda bhavan for a friend.It was tasty and great and all that,but it had less of dry fruits and more of Coconut and Dates. So that gave me the idea.Got lots of recipes while I searched for Dates Laddu and finally I chose Sailaja's Dates Burfi with Nuts.Mainly because it uses very little amount of ghee[just 1 tbsp]and then there’s no added sugar,which makes it almost fat-free. In a thick bottomed kadai,add the ghee and roast the dry fruits-nuts on a slow flame for 2-3 minutes. Remove from the kadai and keep aside. In the same pan,add the dates and keep stirring till the dates start to melt**. Mix the roasted nuts and dry fruits with the melted dates and mix well. 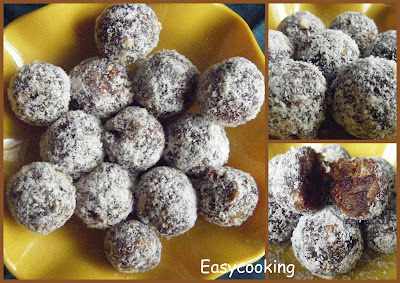 When it is still warm,make small laddus and roll them in dessicated coconut. *I found the laddus lot less sweet for my standards:),so I mixed some powdered sugar along with the dessicated coconut and then rolled the laddus in them. **While I was stirring the dates,they started burning slightly,so I immediately removed the dates from the kadai and Microwaved the dates on high power for 1 minute.That solved the problem and the dates were melted perfectly. wow divya this is really lovely laddu and healthy too.. looks gorgeous and tempting too.. wish to have one right away.. The dusting of coconut in brown color laddu really looks so rich. Perfect low-fat sweet to satisfy the sweet cravings. 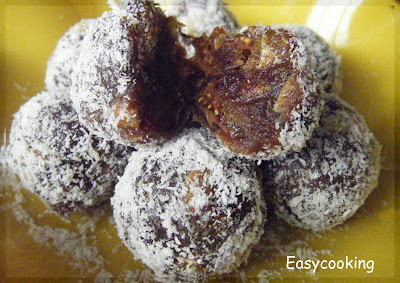 here we get awesome dates nd i have tried date balls vth it too....but only diff is never coated it vth coconut. Lovely Laddu dear...Nice n contrast..healthy one..
Laddu with a Classic Touch!.. oh wooow Divya, It looks so gorgeous and healthy.The brown and white color looks so so good. I am bookmarking this yummy recipe. wow what a healthy ladoo. I am also on a look out for fat free things and I agree to find them here is not easy. Thanks for sharing. good one..looks yummy..sugarless sweets are always so appealing..
fat free and healthy sweets are very rare!! these look lovely! wow those laddos looks delicious & healthy Divya. My husbnad loves dates and dry fruits. I will try this on him :-) Looks good. Thats totally yummy divya..real healthy too..kids may go crazy..lemme try too..!! These do look delicious. Dates are a delicious and healthy substitute for sugar, and are so flavorful on their own. Looks delicious. Very nice and yummy. They must have tasted very good!So tempting..
Wow Divya, these look tooooo good!! Thats definitely healthy and they look great. Would be a wonderful winter treat. I make these too....isn't it easy and delicious! Oh these laddoos look gorgeous! Excellent, very very nice, dont add sugar, its good for weight watchers. I made these today.Came out great..super easy and healthy too. My dates did not "melt" at first so I added 1 tablespoon of water and once that's absorbed had to add one more tablespoon to achieve the soft consistency. WOW..i tried this today and it came out well.. WOW..I tried this today and it came out really well..